Almonds are a quick and easy snack and make a good garnish for many dishes. Almonds also offer health benefits when eaten in moderation. The nuts are fairly high in fat, but the fat is mainly the unsaturated type that can help lower cholesterol levels. Commercial smoked almonds typically add oil, salt, preservatives and smoke flavoring to the nuts, which increases the fat and calories. A serving size of 1 ounce is a handful of nuts, which is all you need to get health benefits while keeping fat and calories within reasonable limits. The calorie content of smoked almonds varies between manufacturers depending on the proportion of ingredients. An average serving of 1 ounce contains around 170 calories and 15 to 16 grams of fat. Around a quarter of the calories are derived from the fat content. Most of the fat in smoked almonds is heart-healthy monounsaturated fat, but each serving does contain 1 to 2 grams of saturated fat. A serving of smoked almonds provides nearly a quarter of your recommended daily intake of fat. An ounce of smoked almonds has no cholesterol and 5 grams of carbohydrates. Three grams of the carbohydrates are dietary fiber. A serving of nuts contains 6 grams of protein. 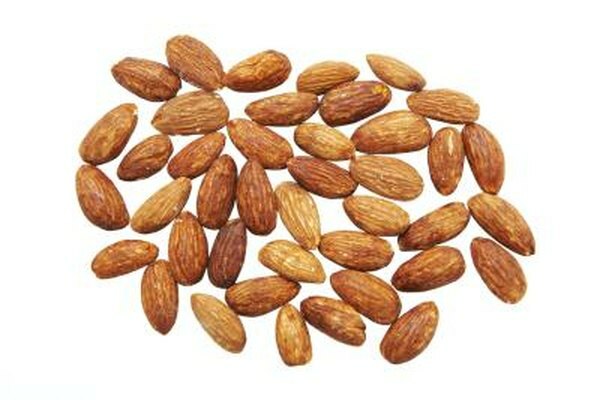 Smoked almonds are a good source of vitamin E and magnesium, and also provide calcium and iron. The sodium content of smoked almonds varies significantly among producers, with a serving typically offering 150 to 250 grams of sodium in each serving. Almonds offer the benefit of helping to reduce blood pressure and the risk of developing heart disease. The nuts contain fiber, which can aid in weight loss and help lower cholesterol levels. A serving of smoked almonds provides over a third of the vitamin E you need each day. A diet with adequate amounts of vitamin E may help protect against decline in physical function in community-living older adults, notes a study published in "The Journal of the American Medical Association." A serving size of 1 ounce of smoked almonds contains 20 to 24 nuts. A serving should fit in the palm of your hand. To get the benefits of smoked almonds without snacking on the whole nuts, try chopping and sprinkling them on salads, vegetables or yogurt. Read the labels of commercial nuts carefully for the sodium content. You can create your own version of smoked almonds by tossing almonds with a little oil and smoke flavoring and roasting them briefly in an oven, with or without salt. Roasting your own almonds gives you more control over the fat and sodium content.